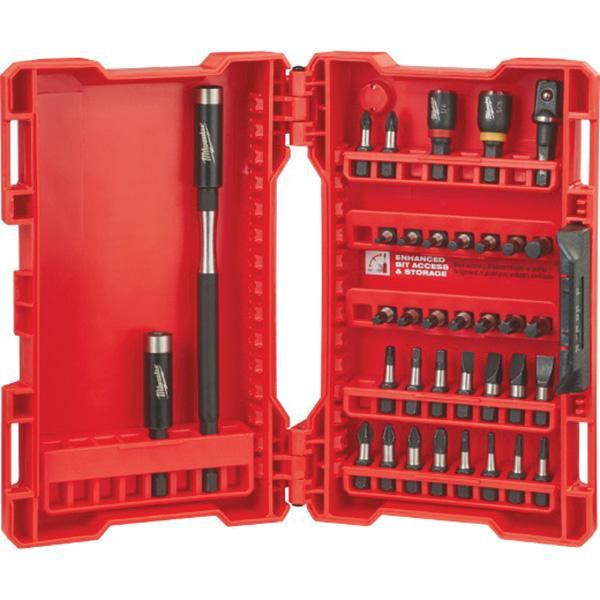 Milwaukee Tool Shockwave™ 36-Piece Impact driver bit set includes 1/4-Inch insert magnetic nut driver, 5/16-Inch insert magnetic nut driver, insert 3/8-Inch socket adapter, SHOCKWAVE™ 6-Inch magnetic bit tip holder, 1-Inch hex bit, 1/4-Inch hex bit, 1/8-Inch hex bit, 3/16-Inch hex bit, 3/32-Inch hex bit, 5/32-Inch hex bit and SHOCKWAVE™ compact magnetic bit holder. It contains 1-Inch P1 Phillips bit, three 1-Inch P2 Phillips bits, 1-Inch P3 Phillips bit, Phillips reduced 1-Inch PR2 bit, two 1-Inch #10 bit, 1-Inch #12 bit, 1-Inch #8 slotted bit, 1-Inch SQ1 square bit, two 1-Inch SQ2 square bit, 1-Inch SQ3 square bit, 1-Inch T10 bit, 1-Inch T15 bit, two 1-Inch T20 bit, two 1-Inch T25 bit, 1-Inch T27 bit, 1-Inch T30 bit and 1-Inch T40 TORX® bit. Precise fit custom machined tip of bit holder restricts stripping and reduces wobble. Driver bits are extremely durable for the most demanding application.